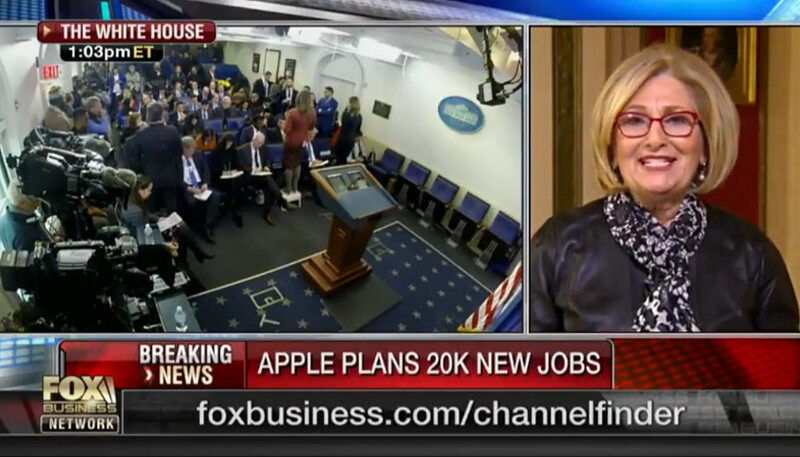 Representative Diane Black (R-TN-06) joined Charles Payne on Wednesday’s Fox News broadcast of ‘Cavuto Coast to Coast’ to discuss the possibility of a government shutdown, the inevitable blaming of Republicans by the mainstream media for it, and also the breaking news of Apple, Inc.’s decision to invest $350 billion in the United States which they say will create 20,000 new jobs. “I’ve got breaking news I want to share and get your opinion on this, as well,” Payne said, clearly listening to his earpiece. “I believe we cannot stop this wind,” she said. “We’ve talked about this in the last three years that we have been working on this tax reform bill, ‘If we could only get there, we would really actually see the results,’ – and we’re seeing those now! Until recently, Representative Diane Black chaired the House Budget Committee, and has been repeatedly praised by President Trump for her worked to put together and pass the once-in-a-lifetime tax reform package widely acknowledged as the spark that some analysts predict could result in a 4 percent GDP growth in 2018. Black resigned her leadership position in order to focus on her run for Governor. According the to latest Tennessee Star / Trition poll, Black is currently ten points ahead of Randy Boyd, her closest competitor for the GOP nomination as the state’s top executive.